"Paranoid" is released on iTunes tomorrow (or today at midnight)! MAKE IT #1!!! Nick Jonas featured on an E! special this Thursday at 10pm on E! In this hour-long special, celebrities like Nick Jonas, Christina Applegate, Montel Williams, Paula Abdul and others offer in depth interviews surrounding their traumatic medical experiences. just wanted to catch everyone up. We had a great show in the Bahamas. It was our last show there. They have been a blast. It was great to do some smaller shows again. We just arrived back in one of our favorite cities in the world - LONDON!!! It is so wonderful here. We are here to premiere our 3D Concert Movie and introduce our new single PARANOID to the UK. We are so close to the new CD, tour, etc. We can’t wait to see everyone again. Mexico on May 17th have been postponed to July 31, 2009. All tickets purchased for May 17th will be honored on this new date. There will still be both afternoon and evening shows on this new date. Any fans unable to attend the rescheduled shows may receive refunds at the Arena Box Office beginning next Wednesday, May 13.
want to cause parents and families any concern over their children attending the concerts. 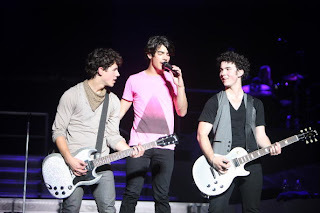 Many fans are traveling great distances to see and experience a Jonas Brothers concert for the first time and we want them to have the best-and.. PLEASE, keep the swine flu in Mexico! I don't want the LA show to be postponed!